We say "point or area" in most cases it is not a specific point which is either urgent or big, but rather a group of points in the same vicinity. For instance, urgent could refer to an area where either a knight's move slide or a diagonal move was urgent, just as a big point could be any of a group of extensions one point higher or lower or narrower or wider. The proverb holds that urgent points should be played before so-called "big" points. 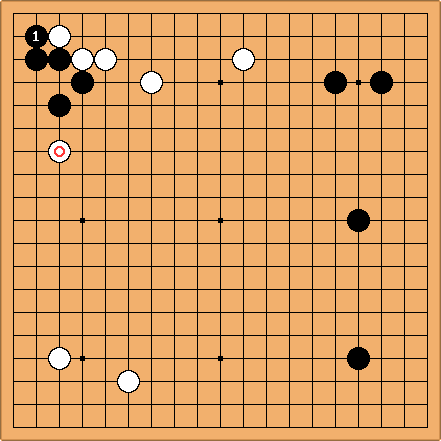 See Play urgent moves before big moves (Kyuba before Oba). Big points, which are normally corner enclosures or extensions along the sides, tend to be points or areas which the players can occupy in turn, somewhat leisurely. Urgent points, by contrast, are points or areas which change the dynamic of the opening, for example, by making one side stronger and the other weaker at the same time. A typical example is a move which simultaneously stabilizes your group while destabilizing the opponent's. An urgent point is characterized by the fact that if one player fails to play there, taking an big point instead, the other player will invariably leap at the chance to play that urgent point, changing the dynamic of the game in the other direction. The following two examples come from the insert, "Ooba, Kyuuba, Dameba", in the April, 1989 issue of Kido. is an urgent point. It secures Black's group and threatens . If Black instead plays a so-called "big" point such as in the middle of the lower side, White may immediately play at 1 and take the initiative, or play elsewhere such as along the left side in such a way as to force Black to seek to stabilize his group. In this position, takes away White's potential base and secures the corner. 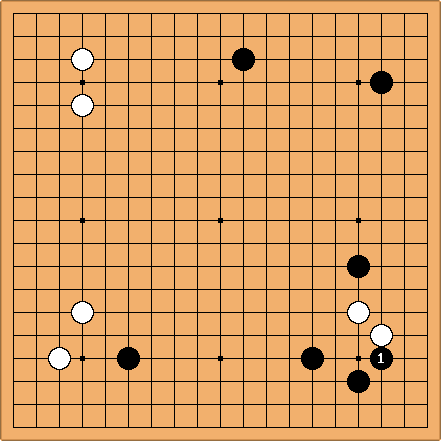 If Black instead plays a so-called "big" point such as an extension on the top, White will slide into the lower right corner, stabilizing himself and setting up attacks on Black's stone on the right or even Black's stones in the lower right. The following example from Jowa, Powerful Fighter (Gohwan Jowa) by Takagi Shoichi, pp. 60 - 61), illustrates the fact that urgent point refers to any move in a contiguous area, not just one specific point. It is urgent for White to do something in the upper left. 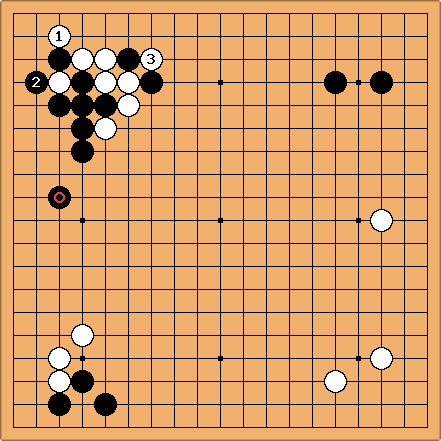 Normally would be considered the vital point for shape, but Takagi recommends starting with , assuming that Black will respond with . This shows how the urgent point is not confined to a single point. Takagi comments that White is thick on the top side and is too close.